In the last post, we summarized several queries concerning the current state of Thomas (The remains of Thomas). What does state mean? Well, the norm would be for the remains to be in the ground under the stone. If they are not, usually there is some explanation. The following is the start of some sleuthing that is needed to establish the 'state' of many others, not just Thomas Gardner (planter). 1. 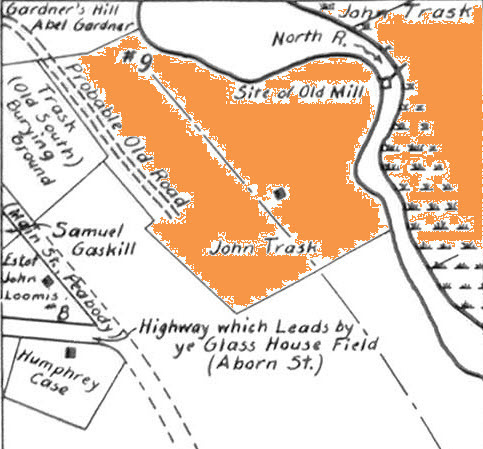 In his earlier book, Dr. Frank (1907) wrote that court records indicated that Gardner Hill was around Main and Grove in Salem (lower red line, image). That means, too, the old burial ground. In other places, I have seen arguments that Harmony Grove touches where the Gardner plot was. Well, we will see. One opinion talked about a few yards of movement from the old plot to the corner where stones were thrown. Well, how few might few be? Of note, we have to consider the North River. Then, Dr. Frank (1933) wrote that Samuel Pickering Gardner, ancestor of the John Lowell Gardners, had visited the place (1830s?) and noted that Samuel had written his observations which Dr. Frank got to read. The place was being used for tanning operations which caused some stones to have already been thrown aside, including that of Thomas, the planter. In this image, I rotated the old and the new views to almost agree. The markings map to a few landmarks. Notice that this has the hill on the other side of the river from Harmony Grove Cemetery. That is, looking up river, to the left. So, we do have to consider the river. Too, we have to look at Trask's property and burial site as it is germane to the topics to discuss. 2. So, I have been poking around. We can start with Perley's map that shows Salem in 1700 based upon Sidney's study of the documents (Sidney Perley 1858-1928). Also, we are talking about Frank A. Gardner, MD (1861-1938). So, these two are cohorts. When Sidney got ill, Lucie, Dr. Frank's sister, picked up his work (Lucie following Sidney). Lucie and Dr. Frank published a whole lot of material in this regard in The Massachusetts Magazine. The image comes from the Nutfield Genealogy post on Trask (see prior paragraph for link). 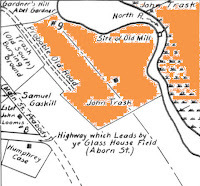 Notice that Gardner's Hill is next to the Trask cemetery. That is, on the same side of the river. Note, too, the bulging of the river at that point. 3. Now, if we jump ahead to a view that is later, we can see Harmony Grove on the other side of the river which has been reconfigured. If you follow the history of the river, it has been encroached upon, and polluted, to support industry. And, tanning of leather for shoes turned out to be a huge deal (for a while). Samuel, above, saw the beginning of this. In the below image, I put a red circle about where Trask's (South) burying place was. Notice the difference in the shape of the river? All of this is preliminary to a greater study that we will do. What happened to the bones of the 150 or so souls who were buried? It is a subject worth digging into (no pun). And, Gardners have to do this work with help. 4. Finally, let me show what a little sleuthing does. We need to do a lot more. I found a map at a Brit source that was with an article on glass making in the colonies, namely in Salem: Glass blower at Salem. The article is not very old; the map seems to be of the time (however, I do not know its provenance - if it was done in 1985, then that's worse than what Sidney (who was quite thorough) did a hundred years ago). There is a lot more to learn. However, we intend to push to get this settled in the sense of the most reasonable answer that we can do given what we can gather as data. There are 150 souls, perhaps, looking from some type of recognition. We ought to, as well, get a list of the names of those buried at Gardner's Hills. 08/16/2018 -- Added a virtual cemetery to findagrave: Gardner's Hill. With this, we can have people put memorials for those who were known to have been buried at Gardner's Hill and, at the same time, reference where they or their stones were moved. MHC Report: some hills approached 200 feet. 08/17/2018 -- Gardner's Hill on findagrave is now Gardner's Hill Burial Ground (Defunct). It points to Harmony Grove Cemetery with a few words. Also, the rule is there will be no memorials connected to this. So, we'll need to figure out another method to have a virtual view of who was buried there. For starters, we can start with a page here on this blog and improve as we go. Gardner's Hill was in the same family through seven generations. It was sold at the eighth generation. We'll be writing more about this. However, it's a gain, as when one looks at cemeteries in Salem, MA, they will see Gardner's Hill. Yesterday, finally, I learned the real state of the remains of Thomas. Or, let's say, we can use the observation of Samuel Pickering Gardner to establish some notion prior to the road work of the 1840s. Then, what might have happened post that bears some attention. To me, the least that we can do is build some type of 'virtual' view of Gardner Hill with its grave sites. To that, then, can be attached the large set of data points that will accrue to analysis. For starters, we need to see overlays of old and new maps so that we can point out what might have happened over the period of the first raking off of the gravestones until now. Essentially, it is unclear how many gravestone were moved, whose bodies may have been re-interned, or just how many graves were left to be scraped by the road work or to be covered over by the progress of building. More research is to be done. Dr. Frank talked to George Augustus Gardner about, and read the, notes that George had that had been written by Samuel Pickering Gardner who had visited Gardner's Burial Ground sometime prior to the period of the road work and reported his observations. You see, and I verified this yesterday, lots of references on-line mention words like 'graves moved' or 're-interned' or any other of the number of things that a civilized society does to its cemeteries (from my perspective which can be explained, as needed). On the other hand, after yesterday, I thought of the Salem Fire (retribution - after all, we're talking Salem) which came out of an industrial area related to shoes. The first desecration of the grave sites relate to the push for commerce in that industry. As such, by the time the roadwork was done in the 1840s, graves had already been disturbed with stones scattered about. Dr. Frank did see Samuel's notes and made a brief comment (see pages 17 and 18 of Gardner Memorial - 1933). That is a good place to start. In the meantime, here is a history of posts of the Thomas Gardner Society, Inc. devoted to the subject. Where is Thomas? - (Oct, 2010) On a visit to Harmony Grove, we got familiar with the layout and found the graves of Ann's Gardner ancestors. Dr. Frank is buried in the same plot as her grandfather and great-grandfather. Also, we saw the area where people are directed. It didn't make sense. Later I called and heard 'graves were moved' (but there was no clear indication where Thomas' remains were). Where is Thomas? III - (Aug, 2015) Motivated by a Wikipedia edit, I did further looking. One addition was a map by Perley put next to a modern aerial view where landmarks can be identified. I noted that the 'burial issue' was open and needs to be resolved. In my mind, that involved, mainly, finding where bones may have been thrown in Harmony Grove and identifying this. But, now I see that it is going to be more involved. Yes, bones were cast to the wind, if you would. There are many things that could be done, so expect that we will continue this discussion. Today's purpose was merely to set the record straight. We do not know the status of the remains of a whole lot of people. Too, stones were thrown about. Well, the argument is that they broke. Okay. At least, Seeth was given some notice. Also, Buffum is noted as having the earliest stone over grounds that do not contain his remains. 08/28/2018 -- After some research, the fact that the stones were moved arose. So, we added a page for this cemetery, now defunct, on findagrave. Also, we can plan several tasks related to important issues, such as who was buried there, what stones stand, how many were broken, etc. As well, we can model the area as of 1640s, to get an idea of the size. 02/22/2019 -- Gardner's Beacon, Volume IX, Number 1 addresses the problem of "Where is Thomas?" that has been needing attention, now, for a couple of hundred years, almost. From the beginning, we have used Thomas and Margaret, following Dr. Frank. An example is looking at the 'great house' that John Endicott had brought over to Salem from Cape Ann: Thomas' house. About the same time, Gardner's Beacon, Vol I, No. 3, looked at Margaret, in particular, and I used "Margaret's house" in terms of that structure. We were newbies, back then, but I had noticed that some later genealogist actually agreed with Dr. Frank, too. However, the Great Migration Begins of R.C. Anderson suggested another wife who was the mother of the children. I got several emails pointing that out to me. So, I dug in and pulled out those things being referenced. Someone has to do this now and then, as many citations follow someone else (many times, without doing their own verification). Gardner Research will go back to first principles, if you would. My first response (Sep 2012) - About Margaret - as the next bullet shows, the argument mentioned a 1639 entry in the church record. But, to me, it was Margaret; Thomas didn't align himself until 1637. Their kids were growing up, so they had to smooth the way. My second response (Nov 2012) - How many wives? This post puts TAG side-by-side with the Great Migration material. The conclusion was that the NEHGS was looking at 1000s of people. The Gardners would dig into one or two, with regard to this issue. And, in the meantime, we would honor good old Dr. Frank. 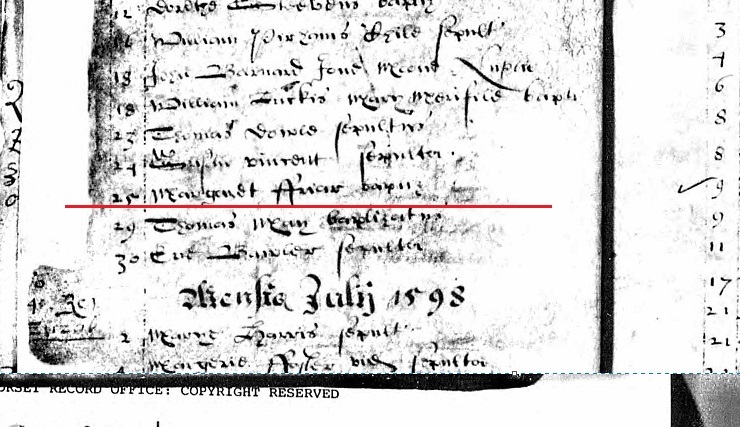 Now, in 2014, John Cook came across the marriage record of Thomas and Margaret at which point we put out the blog post. Too, I went to WikiTree as there was a profile for these two (Thomas Gardner) or should I say three? As, 'unknown' was there. At that time, I did a few things and went on as I was writing several articles (The Essex Genealogist) which have given us ahnentafels for Dr. Frank (his father's side, I now have his hand-written lineage on his mother's side which I'll key in) which includes Benjamin Brown Gardner and Lucy Foster Wilson. We're first cousins, in that sense. Too, I got involved in getting further informed about England and that whole environment. Of late, I got back to looking at Sherborne, for several reasons (son, John; Folger; Dr. Frank, and others). Or, I ought to say Dorset. King John loved his Corfe Castle. Queen Elizabeth is shown in a painting being carried by noblemen at Sherborne Castle (the painting is there). I also stopped by WikiTree to see what was happening. Well, a query had been made in 2016 as to whether the kids ought to be taken from Margaret's profile and moved to that of the unknown. So, I weighed in and mentioned the marriage record from 2014. And, I mentioned the arguments for this: Sherborne, Dorset. I mentioned the Peirce family (for more than Charles Sanders Peirce) as many families have been poking around. We are trying to gather all of this stuff. Like that of the Paine sisters. This will all be documented, and we'll put a link to the material (shortly). As well, we need to look at references to Thomas and Margaret. One known first reference is 1827 by Felt, working in Salem, who talked to a lot of people. We may find more. Too, records are being scanned in all of the time, transcribed, and indexed. So, that will help. After seeing the discussions, I went back to look at my records and found that John Cook had sent to me a baptism record for Margaret (see image), the marriage record of her parents (close enough in time to be her parents), and the will of Margaret's father which mentions her plus a few other things. However, her father died in 1610 so the will mentions Margaret Friar not Gardner. But, we also have birth/baptism records for the first three kids with the names matching. As an aside, we will be looking further at (introducing here) Walter Friar and Grace Mullins of Sherborne. About WikiTree. I found out that the genealogists hang out there. Too, they are trying to stay true to the NEHGS work plus newer stuff, as the entry on Thomas dates from the 1980s. So, the Gardner Research work is considered to be after that. Essentially, there was an agreement that this is the Margaret and Thomas. But, there are lots of other questions to look at. I set a time frame of five years or sooner as that would match up with the 400th of the 1623 entry. A major researcher noted that first year over 100 years ago. That is, a boat arrived in 1623 with a crew that overwintered; another came in 1624. Margaret was on the later one, according to Dr. Frank. But, the purpose for this post? Well, it has been decided to merge unknown and Margaret together. So, the profile for Thomas will have Margaret and Damaris as his wives. Again, everyone. Use, please, Thomas and Margaret without worrying about being dumped on. That is a first step. One of many to come. So, please stay tuned. 09/23/2018 -- Recently, the profile changed to having only two wives. 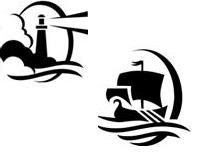 The profile is managed by the Puritan Great Migration Project which is sponsored by NEGHS.